I made a mad scientist over the summer and when we were discussing our idea with Natasha and Andrew, Natasha showed us a video of inside the brain (cited below) and the neurones reminded me of the little plasma ball I made. I showed it to the group and they thought it would be good to have those in the animation so I started making more. Brinsmead, D. (2008). Plasma Ball with Paint Effects. Available: http://area.autodesk.com/blogs/duncan/plasma_ball_with_paint_effects. Last accessed 22nd Jun 2015. Cole, N. (2015). Mad Scientist. Available: https://nataliehcole.wordpress.com/2015/06/22/mad-scientist-2/. Last accessed 2nd Oct 2015. Ivanov, A. (2007). Neurotransmitter Synapse 3D Animation. Available: https://www.youtube.com/watch?v=90cj4NX87Yk. Last accessed 5th Oct 2015. When I was modelling the brain, I came across a problem when modelling the little back bit. When I was using Paint Effects on it, my computer started to move with the speed of a snail with a broken foot. So I simply made it more wrinkly by adding more edge loops and then scaling every other one in, and adding the texture. I also found that I had over 100 textures for the wrinkly bits of the actual brain and I only needed to apply the one texture to the brain with it all selected for the same effect. That helped speed up the computer too. Mark pointed out that the texture on the brain did seem translucent so then I went back and dialled down the transparency giving it a more realistic appearance. I started off modelling the brain stem, before I resorted to googling how to create a realistic brain, having become unsure as to what the rest of it looked like. It took me several attempts to get the shape of the brain the correct shape before doing the Paint Effects to add on the wrinkly bits. digitalworkshop. (2012). 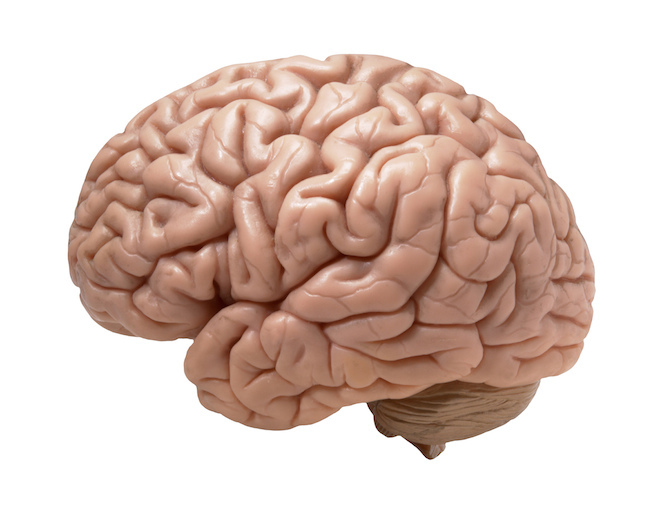 How to Model A Brain in Maya. Available: https://www.youtube.com/watch?v=sG6OvWJdh1U. Last accessed 2nd Oct 2015. Since I was looking at Alzheimer’s with my group in Week 1, I already have some research on the topic. Marieb, E. N. (2004) Human Anatomy & Physiology. 6th ed. San Francisco: Pearson Benjamin Cummings. Martini, F. H. (2004) Fundamentals of Anatomy & Physiology. 6th ed. San Francisco: Pearson Benjamin Cummings. Alzheimer’s Society. (2015). About dementia. Available: http://www.alzheimers.org.uk/site/scripts/documents.php?categoryID=200120. Last accessed 21st Sep 2015. Alzheimer’s Society. (2015). Research. Available: http://www.alzheimers.org.uk/site/scripts/documents.php?categoryID=200422. Last accessed 21st Sep 2015. NHS. (2014). Alzheimer’s disease . Available: http://www.nhs.uk/conditions/Alzheimers-disease/Pages/Introduction.aspx. Last accessed 21st Sep 2015. After we had come up with some of our initial ideas we went back and reviewed what we actually wanted our animation to do, and we decided that we wanted it to inform the audience about a topic. We looked at different ways to inform an audience and then what sort of topic that we wanted to tackle. We narrowed it down to anxiety, making a big deal out of anything and Alzheimer’s. After ideation and doing some concept sketches we then refined what direction we wanted to take in regards to the content of our animation. 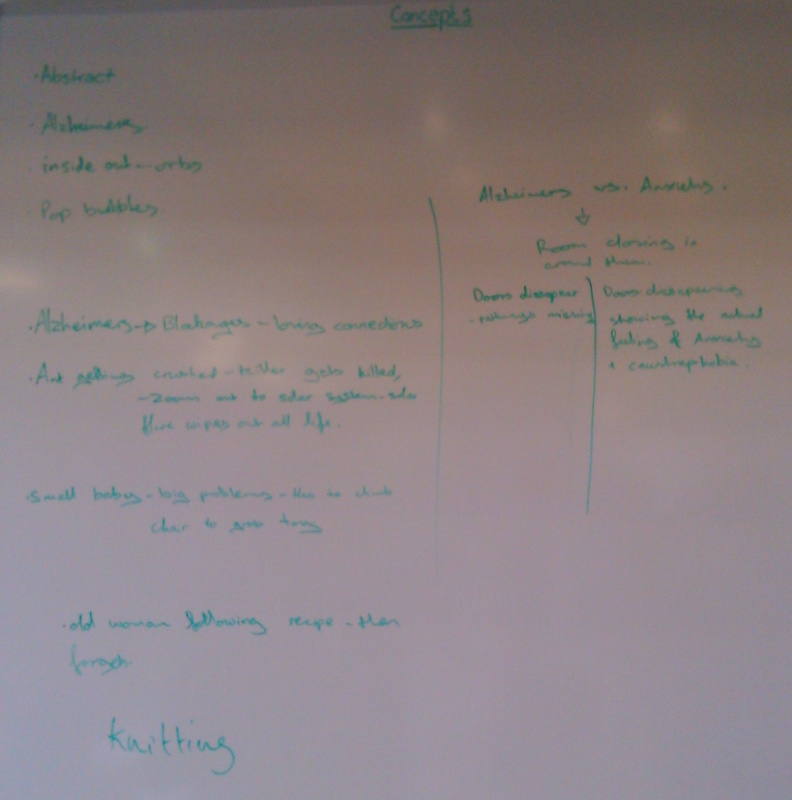 We then decided to focus in on Alzheimers and Anxiety as topics to create an animation around. 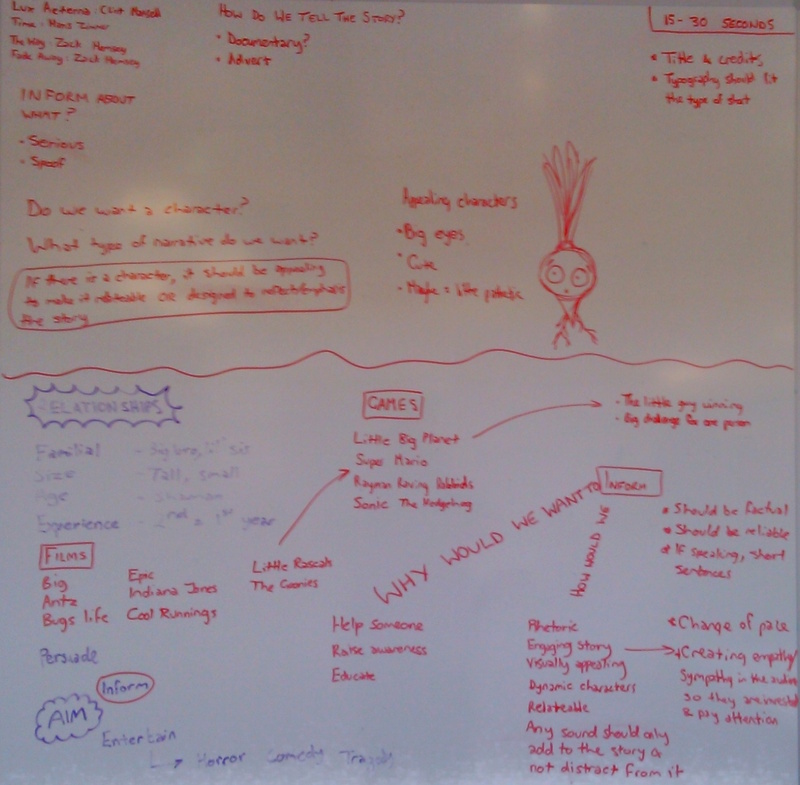 After Ideation, we tried to come up with a number of concept ideas that we could further develop. 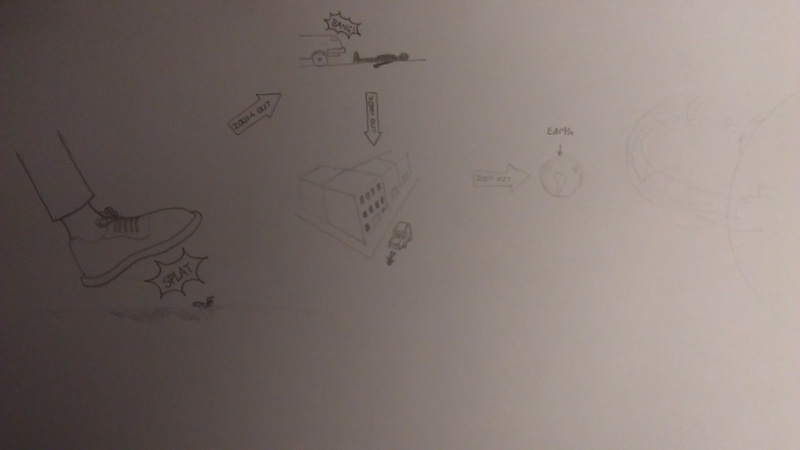 The main ideas were an animation to give a visual representation of Alzheimers, an animation to give a visual representation of anxiety, a little dog getting revenge and an animation which highlights the fact that there is always someone with a bigger problem than you. 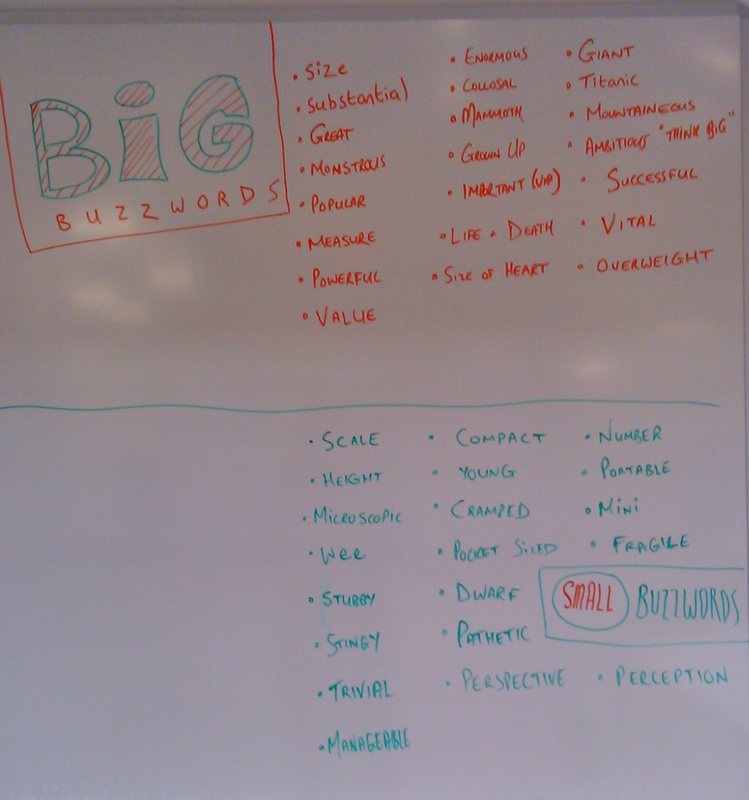 We started by trying to think of words associated with “Big” and “Small”. I also then had a page of different words to maybe help start us thinking of ideas. (This page is in my folder). We then tried to come up with some concept ideas (mine are listed in my Sketchbook).